The degradation of tryptophan in the body can be inhibited with the intelligent use of other nutrients. For instance, the amino acid lysine competes with tryptophan in the same oxidative degradation pathway. This means that in the presence of sufficient lysine, less tryptophan is broken down through oxidation. Supplementation with nicotinamide has also been shown to spare plasma L-tryptophan from oxidation through the major pathway, permitting more plasma L-tryptophan to be available for conversion into serotonin. The primary tryptophan-degrading enzyme is overactivated by inflammatory cytokines. The most comprehensive way to help prevent the enzymatic degradation of tryptophan thus is to suppress the inflammatory factors by taking the proper dose of extracts from ginger, hops, and rosemary. The Optimized TryptoPure® Plus formula contains tryptophan that is certified pure enough to be used as an active ingredient in pharmaceutical products. This pharmaceutical-grade L-tryptophan costs more than other tryptophan raw material as it undergoes significantly more rigorous manufacturing processes to safeguard purity. Other ingredients: vegetable cellulose (capsule), maltodextrin, modified food starch, vegetable stearate, silica, rice flour. This product contains NO milk, egg, fish, peanuts, crustacean shellfish (lobster, crab, shrimp), soybeans, tree nuts, wheat, yeast, or gluten. Contains NO sugar, and no artificial sweeteners, flavors, colors, or preservatives. Serotonin syndrome is characterized by high levels of serotonin and symptoms like confusion, sweating, agitation, nausea, involuntary muscle contractions, and racing heartbeat. Do not take L-tryptophan if you experience these symptoms. Do not take during pregnancy. Do not take L-tryptophan in combination with other agents that increase serotonin levels in the central nervous system. Agents that increase serotonin levels can include psychiatric medications (e.g. antidepressants, lithium), migraine medications (e.g. sumatriptan), Parkinson's disease medications (e.g. carbidopa), and dextromethorphan, an over-the-counter cough suppressant. Do not use before driving or operating heavy machinery. Do you remember how popular tryptophan was in the 1980s? Back in those days, people seeking to lose weight, improve sleep, or alleviate depression used tryptophan to safely increase serotonin levels in their brain. Serotonin is the natural compound that promotes feelings of well-being, satiety, and relaxation. A serotonin deficiency can result in sleep disturbance, anxiety, depression, and a propensity to overeat. In 1989, the FDA restricted the importation of tryptophan, and other countries followed. This forced consumers to switch to expensive prescription drugs that produced only partial effects at best. Tryptophan is an amino acid found naturally in the foods that we eat. 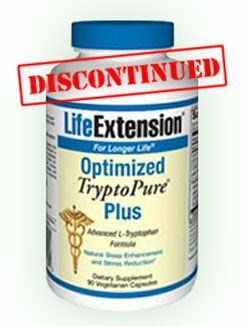 The reason its sale was stopped was because of defective tryptophan made by a sub-standard company. We believe that this prejudicial position against tryptophan caused widespread deficiencies of serotonin. A result of serotonin deficiency may be reflected in today’s epidemic of obesity, depression, anxiety, and insomnia. Despite intense lobbying efforts by pharmaceutical companies, the FDA could not rationally continue to block the sale of tryptophan. After all, tryptophan is not only found in food, but the very tryptophan that the FDA restricted is still used in infant formulas and intravenous feeding solutions. If there were any danger to tryptophan, we would have known about it long ago. Pharmaceutical-pure tryptophan can now be imported for use in dietary supplements. This means that as people age, they may be able to discard certain prescription drugs and once again treat their serotonin deficiency disorder with what Mother Nature intended all along… the amino acid tryptophan itself! Startling research findings reveal that brain serotonin levels decline sharply in most humans as they age, this helps explain why so many people suffer common age-related disorders such as depressed mood and sleep difficulties. Based on these discoveries, aging humans may improve their overall feeling of well being by restoring brain serotonin. It was long ago established that tryptophan is the amino acid needed to produce serotonin in the brain. Regrettably, the amount of tryptophan in a typical diet is barely enough to meet basic metabolic requirements, let alone provide optimal brain serotonin levels. Since tryptophan supplements were removed from the market, there have been increasing numbers of cases of obesity. It would appear that serotonin deficiency may play an important role in the record number of western populations suffering from depression, insomnia, and excess weight gain. In people with major depression, blood levels of tryptophan are often significantly below normal. A number of studies indicate that normal mood depends in large part on adequate brain serotonin stores. Human studies have shown that reducing serotonin levels (by depriving the brain of tryptophan) can induce depression within hours and that supplementation with tryptophan can alleviate depressive symptoms. Depression is one of the most common health disorders affecting elderly people. Doctors still consider it to be a normal consequence of aging. Recent studies, however, have identified specific age-related mechanisms that cause the degradation of tryptophan in elderly individuals. The encouraging news is that there are ways for people to counteract the loss of their precious mood-elevating tryptophan. It turns out that pro-inflammatory cytokines cause tryptophan to degrade in the blood. This occurs because these pro-inflammatory cytokines activate specific enzymes that deplete tryptophan in the bloodstream. The result of diminished blood levels of tryptophan is serotonin deficiency in the brain (and the onset of depression). Pro-inflammatory cytokines are specialized biochemicals secreted by immune cells that are only supposed to be activated in response to acute infection or trauma. As people age, they often chronically overproduce pro-inflammatory cytokines, which subsequently cause inflammatory-related diseases such as arthritis, cancer, dementia and depression, and atherosclerosis. Health-conscious people are already taking nutrients (such as fish oil, green tea, borage oil, curcumin, and flavonoids), which help suppress pro-inflammatory cytokines. The new findings about cytokine-induced degradation of tryptophan explain how aging humans become depressed and why nutrients like fish oil alleviate depression. To give you an idea of how devastating inflammatory cytokines are to tryptophan levels, just look at what happens to people who are given a cytokine drug called interferon-alpha. When interferon-alpha is given to hepatitis C victims, one of the most dangerous side effects is the onset of depression so severe that users of this drug can become suicidal. It turns out that interferon drugs cause tryptophan-degrading enzymes to surge, thus depleting tryptophan in the blood and making less tryptophan available for conversion to serotonin in the brain. It would appear that supplemental tryptophan could enable those with hepatitis C to benefit from interferon drugs without encountering severe depression. In a fascinating new study, scientists measured levels of tryptophan degradation metabolites in the brain. It turns out that people over age 50 had 30% more of these tryptophan degradation metabolites in their brains compared with people under age 50. The doctors who conducted this study stated that their research indicates a 95% probability that older people will have increased levels of these metabolites, reflecting excessive degradation of tryptophan in their brains. This finding further explains why depression is one of the most common mental health problems in adults age 60 and beyond and suggests that supplemental tryptophan, along with cytokine-suppressing agents, could help restore serotonin to more youthful levels and subsequently alleviate depression. Poor sleep affects a significant percentage of older individuals. Trouble falling asleep, waking not rested, waking too early, and difficulty maintaining sleep are the chief sleep complaints in this age group. In response to complaints of poor sleep, more people are prescribed sleeping pills than ever before. Before tryptophan was taken off the market, it was an enormously popular supplement used to alleviate chronic insomnia. Between 1962 and 1982, 40 controlled studies described the effects of tryptophan on human sleepiness and/or sleep. During the 1980s, placebo-controlled human studies documented the sleep-inducing effects of tryptophan. With the new knowledge that tryptophan-depleting enzymes increase as people age, there is now a biochemical basis to help explain why so many older individuals suffer sleep deprivation miseries. Serotonin enables one to calm down and relax. Without adequate serotonin to naturally tranquilize the brain, it becomes excruciatingly difficult for older people to get to sleep. After low-cost tryptophan supplements were restricted, the door swung wide open for pharmaceutical companies to earn billions of dollars selling prescription benzodiazepine drugs such as Xanax® and Halcion®, as well as other sleep-inducing medications such as Ambien®. When the brain is flooded with serotonin, satiety normally occurs. A serotonin deficiency has been associated with the carbohydrate binging that contributes to the accumulation of excess body fat. Obese individuals have low blood tryptophan levels, which indicate that their overeating patterns may be related to a serotonin deficiency in the brain. In a study of obese subjects, levels of tryptophan and the ratio of tryptophan to the other large neutral amino acids in the blood were measured over a 24-hour period. Compared with normal subjects, low tryptophan and a low ratio of tryptophan to other amino acids were seen in the obese study subjects throughout the 24-hour period. The significance of this low ratio of tryptophan is that the other amino acids compete with tryptophan for transport through the blood-brain barrier. If there are high levels of other amino acids in relation to tryptophan in the blood, relatively little tryptophan will enter the brain, causing a chronic serotonin deficiency. This explains the constant hunger that causes so many people to become and remain obese. For those who try to lose weight by consuming fewer calories, the failure rate is well established. In a study that evaluated both depressed and non-depressed women, the effect of dieting was evaluated in relation to blood tryptophan levels. The results showed that in response to consuming a very low calorie diet (1,000 calories/day), blood tryptophan levels plummeted. This finding indicates that the intense hunger that occurs in response to reduced calorie intake is at least partially caused by the tryptophan deficiency that ensues. The implication is that it may be impossible for certain people to chronically reduce their calorie intake because a deficit of tryptophan/serotonin would cause unbearable chronic hunger. It is well known that carbohydrate binging plays a role in unwanted weight gain, yet people consume more carbohydrates than ever. Despite numerous books extolling the fat-loss benefits of "low-carb” diets, few people are able to avoid excess carbohydrate ingestion over the long term. One reason that people eat too many high-glycemic carbohydrates is the brain’s need to achieve "feel good” levels of serotonin. While serotonin is made from the amino acid tryptophan, eating protein-rich foods does little good since other amino acids in the food compete for transport into the brain. When carbohydrates are ingested, the resulting insulin surge causes a depletion of these competing amino acids in the blood by increasing their uptake into muscle, thus sparing tryptophan to more readily transport into the brain for conversion to serotonin. The need for tryptophan can most easily be understood by the carbohydrate binging that occurs when people become serotonin-deficient. In any normal diet, be it omnivorous or vegetarian, protein-based tryptophan is the least plentiful of all amino acids. A typical diet provides only 1,000 to 1,500 mg/day of tryptophan, yet there is much competition in the body for this scarce amino acid. Tryptophan is used to make various proteins that form structures of the body. In people with low-to-moderate intakes of vitamin B3 (niacin), tryptophan may be used to make B3 in the liver at the astounding ratio of 60 mg tryptophan to make just 1 mg of vitamin B3. This means that in vitamin B3-deficient people, virtually all dietary tryptophan may be used to synthesize B3, leaving none available for conversion to tranquilizing serotonin in the brain. In people who are even marginally deficient in vitamin B6, tryptophan may be rapidly degraded into mildly toxic metabolites. Thus, the brain typically receives less than 1% of ingested tryptophan from dietary sources. Dietary tryptophan contributes very little actual tryptophan to the brain, yet tryptophan is the only normal dietary raw material for serotonin synthesis in the brain. Is it any wonder that so many people today suffer from disorders (depression, insomnia, excess weight gain) associated with a serotonin deficiency? At the time that the FDA restricted tryptophan, it was one the most popular dietary supplements sold in the United States. Perhaps it is a coincidence, but since 1989, the percentages of overweight and obese adult Americans have soared. Could it be that a nationwide serotonin deficiency has led to the high-carbohydrate overeating syndrome that so many Americans suffer from today? This has also been the case in the UK and other "western" nations. The removal of tryptophan created an economic windfall for the drug companies. Sales of drugs that interfere with the brain’s reuptake of serotonin (like Prozac®, and later Paxil® and Zoloft®) shot through the roof, earning tens of billions of dollars of profits for drug companies. While these drugs caused large numbers of unpleasant and possibly lethal side effects, the FDA withdrew none of them. The ensuing epidemic of weight gain and sleeplessness resulted in dozens of anti-obesity and anti-insomnia drugs being approved by the FDA, some of which had horrendous side effects, and others that had virtually no efficacy. Critics contend that the contaminated tryptophan coming from one sub-standard Japanese company provided a convenient excuse for the FDA to restrict the sale of all tryptophan dietary supplements. The FDA’s actions guaranteed that Americans would become tryptophan-deficient, and therefore turn to prescription drugs for relief from a host of disorders related to insufficient serotonin in the brain. Consumers now have access to pharmaceutical-pure tryptophan as a dietary supplement. For 19 years, people have been forced to settle for less-than-optimal levels of tryptophan/serotonin in their bodies. Based on what has been published in the peer-reviewed scientific literature, it would appear that consumers have suffered enormously from a host of disorders related to lack of serotonin in the brain. Pharmaceutical companies, on the other hand, have accumulated exorbitant wealth, as depressed, overweight, and sleep-deprived consumers were forced to experiment with costly and side effect-laden drugs in order to combat the effects of serotonin deficiency. If tryptophan dietary supplements provide relief to those suffering from common age-related disorders such as anxiety, depressed mood, sleeplessness, and unwanted weight gain, this 19 year restriction on this natural agent may turn out to be one of the cruelest hoaxes of all time.